..had to share because it’s just too dang funny! One cramming for a psychology exam the other “dressing up” Sophia on Disney Junior. Neither one of them paying attention to the other which makes this picture hilarious how similar they actually are. LOL love it, they were not paying attention to each other and they didn’t notice you took a pic…. Wow! 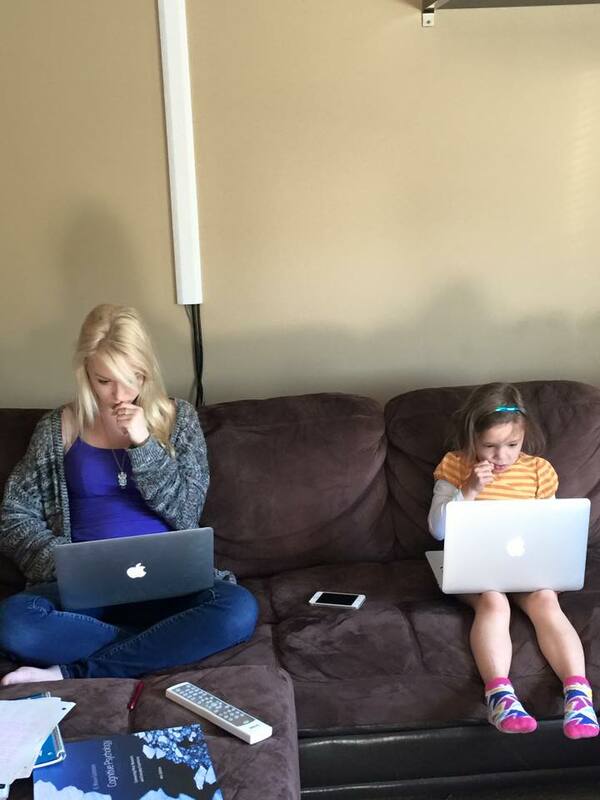 They both with an APPLE computer. And both with one hand to face/mouth staring at the screen. Different but definitely the same. My oldest was studying for her exam and my youngest was playing on Playhouse Disney at the time. They weren’t even aware that they were mirroring each other. Great minds think alike. That’s a great picture. This picture is adorable!! I love how they sitting the exact same way! this is just adorable!! happy to have come across your site via aloha friday link up! can’t wait to check out more from your site!! 🙂 have a great weekend! This is so cute. What was their reaction when you showed them the photo? Super cute! This one is a keeper and maybe even frame-worthy! Oh that is just too darn cute. What a moment you captured. Very cute! Their expressions are priceless and on point with each other. Adventures on the computer!! That really is funny. When I watch my children I can see so much of myself and my husband reflected in their mannerisms.